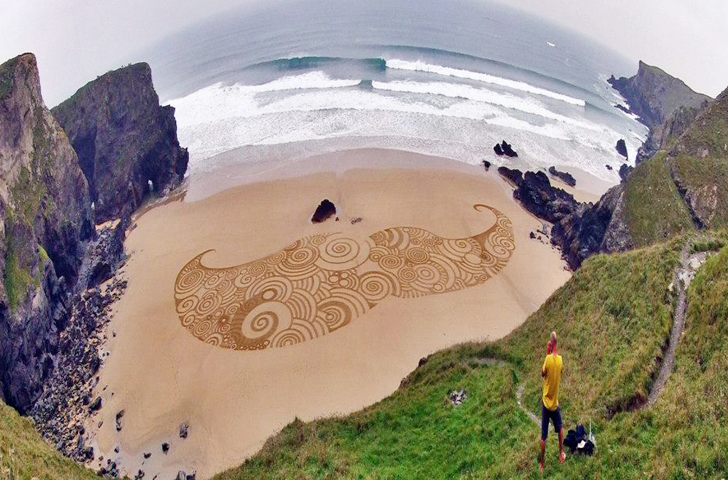 Artist Tony Plant Creates Epic Sand Etchings on England’s Beaches Using Only a Rake! 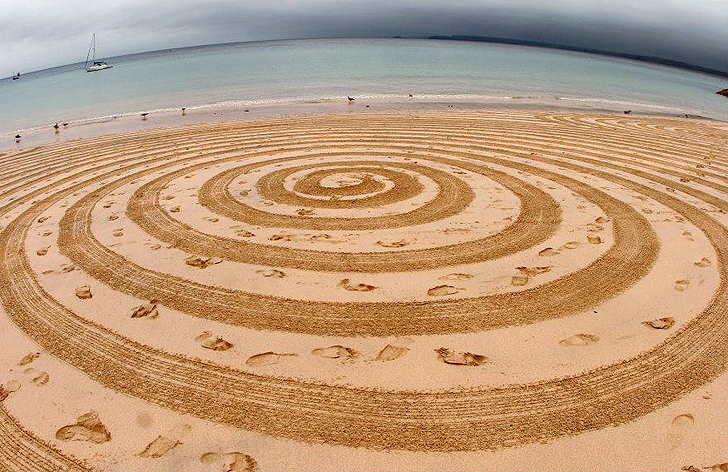 Environmental artist <a href="http://www.tonyplant.co.uk" target="_blank">Tony Plant</a>’s giant sand drawings transform England’s beaches into swirling temporary canvases. In a process similar to the creation of <a href="https://inhabitat.com/snow-artist-simon-beck-stamps-a-new-crop-of-gorgeous-snow-patterned-fields-in-france/" target="_blank">Simon Beck’s stamped snowfields</a>, Plant creates <a href="https://inhabitat.com/nespoons-delicate-doily-art-adorns-a-stretch-of-the-baltics-oak-beach/" target="_blank">intricate patterns on large beaches</a> that can only be fully appreciated from a bird’s eye view. Using only a rake and sticks, Plant creates his pieces at low tide - and they only last a few hours before the sea reclaims the beach. 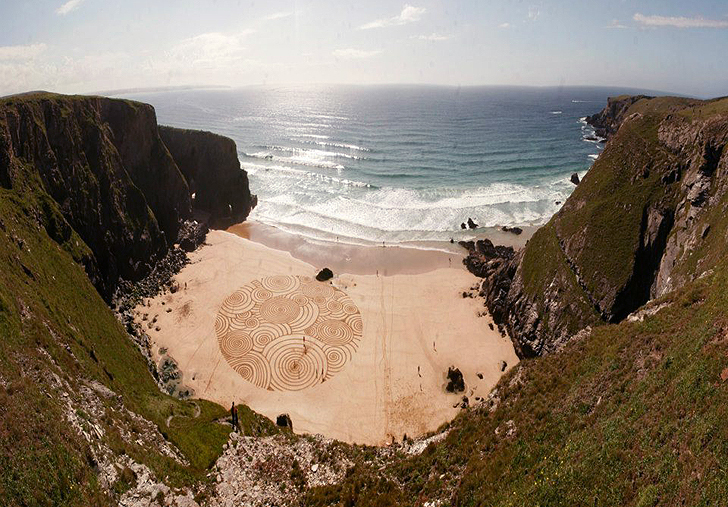 Tony Plant has been using the <a href="https://inhabitat.com/gerry-barrys-incredible-land-art-installations-harmonize-with-the-irish-landscape/" target="_blank">beach as his canvas</a> for over twenty years. 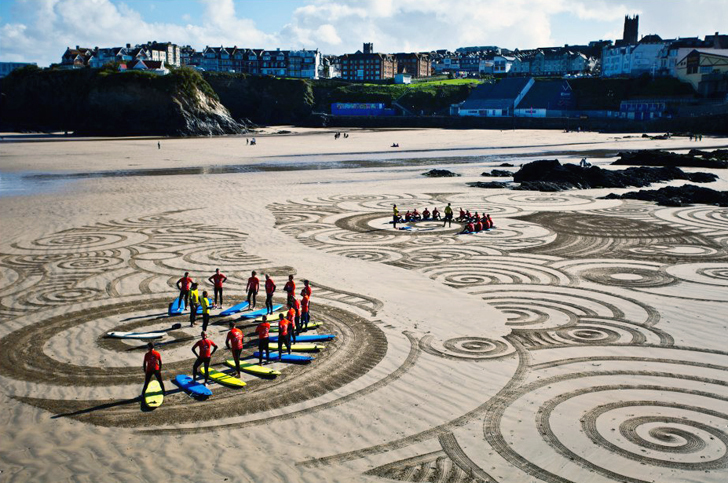 The surfer, environmental artist, and photographer creates these large scale sand etchings simply for the delight of beach bums and passersby. Many of his piece are located in peak surfing areas, giving surfers an added bonus to the beauty of catching the perfect wave. 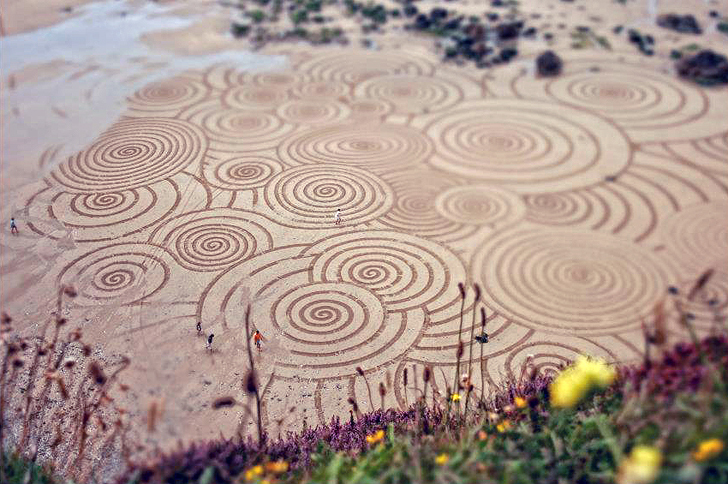 Plant works at low tide, when the sand is wet, which is optimal for raking patterns that will stay put until he is complete with the pattern. 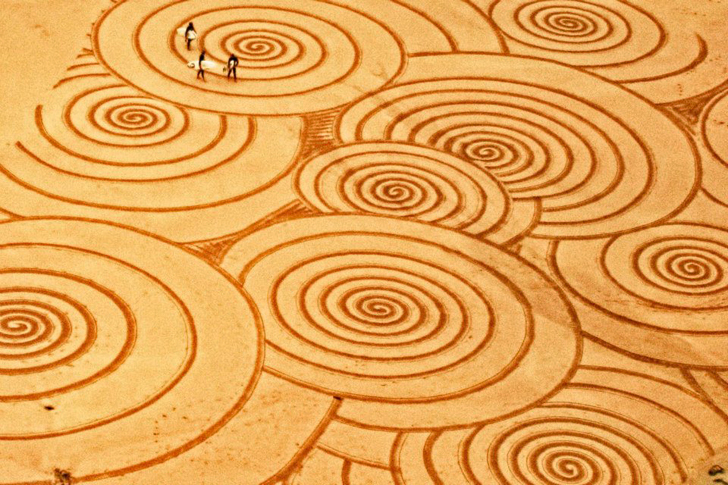 Using only a common yard rake, he maps out swirls and curls, in forms that look flawless from elevated vantage points. His foot prints are too subtle to be seen from a distance, so the patterns look as if they were mysteriously placed there by some unknown instrument. He then captures the <a href="https://inhabitat.com/tag/land-art/" target="_blank">land art</a> installations on film, surrounded by the natural beauty of the land and sea. Yet once nature takes it course, the ephemeral pieces wash away. As the tide rolls in, or storms pass through, the beach canvas is wiped clean- and ready for Plant to revisit with another design. 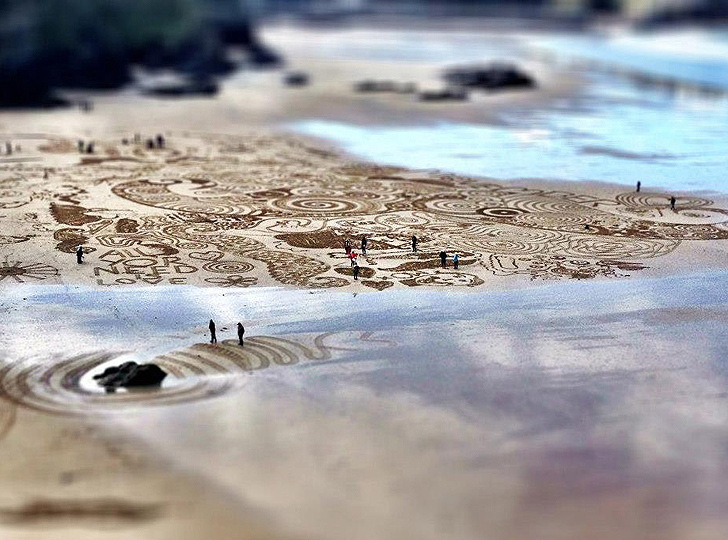 Environmental artist Tony Plant’s giant sand drawings transform England’s beaches into swirling temporary canvases. In a process similar to the creation of Simon Beck’s stamped snowfields, Plant creates intricate patterns on large beaches that can only be fully appreciated from a bird’s eye view. Using only a rake and sticks, Plant creates his pieces at low tide - and they only last a few hours before the sea reclaims the beach.